Disingenuous dialog? Two can play at that game! | WOTM Watchdog! On the October 11th edition of Way of the Master Radio, Todd Friel and guest Robert Spencer of jihadwatch.org discussed the "disingenuous dialog" of a group of 131 Muslims scholars. Â These scholars, who represent every sect of Islam, are proposing that Christians and Muslims work together to find a way to co-exist peacefully, citing both Koran and Bible verses supporting their pro-peace message. Â Mr. Friel and Mr. Spencer then proceeded to criticize this Muslim council for failing to acknowledge the numerous passages in the Koran calling for the death of Christians and others deemed infidels by Islam. Now, far be it from me to defend Islam. Â I'm not giving them a free pass. Â From my atheistic frame of reference, there is very little distinction between the various forms of theism. Â They're all equally false and potentially dangerous, and for very similar reasons. Â But this blog isn't about criticizing Islam. Â It's about criticizing Way of the Master. Â And they're Christians. While criticizing Muslims for failing to acknowledge that their scripture encourages (or even requires) violence, cruelty, and murder, it seems that Mr. Friel is engaging in a nearly-identical game of disingenuous dialog. Â The Christian Bible is also chock-full of passages encouraging violence, cruelty, and murder. Â I could sit here all day quoting Old Testament war epics and ridiculously extreme punishments for relatively minor crimes (remember, folks: talking back to your parents is a capital offense), but I don't have that kind of time. Â Besides, Mr. Friel would most likely dismiss them as being "old covenant" or "pretaining to those people at that time" and having no relevance to us. Â Unfortunately for Todd, Jesus disagreed. Â Old Testament laws, in all their absurd cruelty, were just peachy with Junior, according to Matthew 5:17. Â In 15:4-7, he criticizes parents for not killing their disobedient children. Â Todd, have your children always been obedient? Â If not, have you killed them? Â For shame! Matthew 10:34-37: Â Junior came "not to bring peace, but a sword," and will set family members against each other. Â Doesn't sound like anyone I'd want to follow. Luke 19:27: Â "But those enemies of mine who did not me to be king over them, bring them here and kill them in front of me." Â How very radical Muslim of Jesus. Â I'm sure his father is very proud of the little terrorist. Â Chip off the old block, and all. Luke 10:10-15: Â God is a like slave-owner who beats his slaves "with many blows." Â Junior apparently approves. These are only a few examples. Â The letters of Paul are particularly atrocious. Â In fact, according to an objective analysis done by the folks over at Skeptic's Anotated Bible, there are 857 passages condoning cruelty and violence in the Bible, while the Koran contains a mere 494. 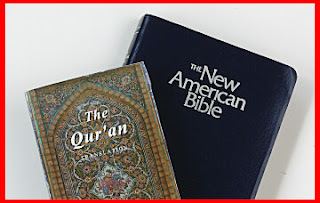 Â Granted, it's important to note that the Bible is a larger volume than the Koran, and in terms of percentages, the Koran does come out ahead. Â But still, that's 857 splinters in Christanity's eye that really need to be addressed before criticizing Islam for exactly the same damn thing.